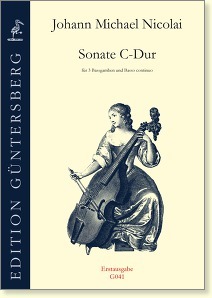 Sonata in C major for 3 bass viols and b.c. The German composer Johann Michael Nicolai was an instrumentalist at the Stuttgart court. His sonorous Sonata in C major for 3 bass viols, which has never before been published, is a major contribution to the repertoire for this in-strumentation. The third viol functions both as solo and bass instrument. Thus, the Sonata can be played even if a keyboard instrument is not available. The modifications and additions which are listed below have been incorporated in the print masters. Depending on the time of print they may or may not be contained in your copy. An additional part "Organo" is available which contains the b. c. plus figuring. To view and print please click here: G041D.